Send your artwork to an asteroid by submitting to the OSIRIS-REx asteroid sample return mission by March 20. Is your art truly out of this world? Aspiring artists will have a shot at getting their work blasted into space and delivered — in digital form — to the asteroid Bennu on the upcoming OSIRIS-REx spacecraft. Here's how it works: Imagine that the first direct detection of gravitational waves, announced in February, totally rocks your world. Every time you think about it you are overwhelmed by a sense of humility and wonder that makes you feel compelled to know more. You decide to take your inspiration to the next level by channeling these feelings into a series of gravitational-wave linoleum block prints. Or you write a gravitational-wave haiku. Or you Photoshop some of the gravitational-wave detector's images into a gravitational-wave GIF, belly dance or hip-hop concept album. 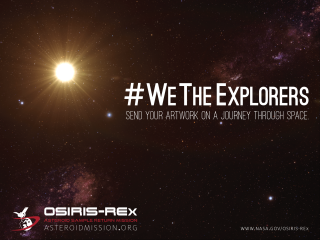 Transfer what you have into digital format and post it to Twitter or Instagram, including the handle @OSIRISREx on Twitter or @OSIRIS_REX on Instagram along with the #WeTheExplorers hashtag and post anytime between now and March 20 at 11:59 p.m. PDT (2:59 a.m. on March 19 EDT), and you're good to go. "Submitted works of art will be saved on a chip on the spacecraft," NASA officials said in a statement. "The spacecraft already carries a chip with more than 442,000 names submitted through the 2014 'Messages to Bennu' campaign." Bear in mind the drive may reach capacity before the March 20 deadline is reached, so you're better off submitting your art sooner rather than later. Technically speaking, the theme of your work doesn't need to be limited to space exploration. According to NASA, you can submit anything that has to do with the spirit of exploration, so your work can range from the inner workings of a tiny brain cell to the vast Antarctic tundra — whatever you personally feel captures the essence of the spirit of exploration. "The development of the spacecraft and instruments has been a hugely creative process, where ultimately the canvas is the machined metal and composites preparing for launch in September," Jason Dworkin, OSIRIS-REx project scientist at NASA's Goddard Space Flight Center in Greenbelt, Maryland, said in the statement. "It is fitting that this endeavor can inspire the public to express their creativity to be carried by OSIRIS-REx into space." A University of Arizona, Tucson–based science team leads the OSIRIS-REx mission observation planning and processing, and Lockheed Martin Space Systems in Denver is building the spacecraft. OSIRIS-REx is the third mission in NASA's New Frontiers Program, a series of solar system exploration missions. (So far, it has spearheaded the New Horizons mission to Pluto and the Juno mission on its way to Jupiter.) NASA's Marshall Space Flight Center in Huntsville, Alabama, manages New Frontiers for the agency's Science Mission Directorate in Washington.